So you’re thinking about getting a nose piercing? You will be following the trends of fashion icons such as Miley Cyrus and Katy Perry. However, you might have a lot of questions about nose jewellery and what to expect when getting pierced. We know about all things piercing related here at Piercing Mania, and we want to share that information with you. Anything you might need to know about nose piercings you can find here, including information on price, jewellery types, proper aftercare and much more. The nostril piercing is the most popular nose piercing type that there is. It is the one that we see most celebrities sporting when they have nose piercings. There is, however, a higher risk of migration when it comes to bridge piercings, which is when the body rejects the placement of piercing and begins moving it. For this reason, a curved barbell is the jewellery of choice for this procedure. Not everyone can have one though unfortunately. If your septum is in any way crooked, it is a no-go. Septum jewellery are the most popular choice for septum piercings but you can get many other piercing rings for your septum. 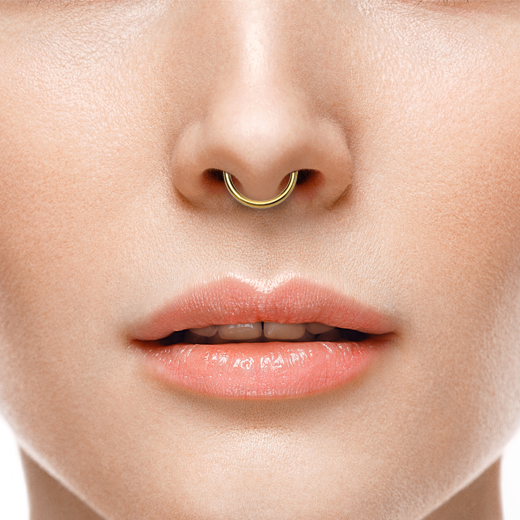 Septum piercings are almost always circular in shape as they must go through both nostrils. A nose ring is as it sounds: a circular hoop or ring which goes through the nostril from the outside and loops around. They are usually smaller and thinner than septum jewellery. A nose stud has an L shape, and may even be referred to as an ‘L-shaped nose stud’. It is a simple design and is inserted through the skin of the nostril. A more intricate design than regular studs, the nose screw is corkscrew shaped to hook into the nose and keep the piercing in place. The nose bone is the simplest jewellery type as it is perfectly straight, with a small ball on the end to prevent the piercing from falling out. We know that people have been piercing their noses for over 4000 years, with the earliest septum piercings dating back to the Middle-East around 2000 BC. It is even referenced in the Old Testament of the Bible. Nose rings are one of the oldest practiced piercings in body modification. It traveled through ancient India and Asia but did not arrive in Europe or other Western Societies for thousands of years. As well as this, nose piercing has been very popular among warrior cultures and tribes throughout history. Nostril studs and rings have become a more common practice in recent years as they have a more subtle look as well as requiring less skill to perform. How much does a nose piercing cost? The cost of a nose piercing depends on the popularity and location of the studio and the piercing artist, while septum piercings can cost a little bit more. How much will getting a nose piercing hurt? Nose piercings are generally not that painful. A regular nostril piercing will not feel too different to a lobe piercing. However, a septum piercing, while looking awesome, is not for the faint-hearted, as it can be considerably more painful. At the end of the day, the pain may depend on each individual's own personal tolerance. Are you ready to get a nose piercing? In most piercing studios the age of consent for a nose piercing is 16. If you are under this age you will need to bring your parents along, so maybe you should talk them. Any piercing requires a commitment to care for it, so make sure you are ready to clean it twice a day and wear this jewellery for the best part of a year. Is a nose piercing the right choice for you? You need to consider any medical reasons such as allergies to metals, or disorders that prevent the healing process. You should also become aware of whether you are allowed to have a nose piercing in work or school, because as stated above if you want to keep it, you cannot remove it for a long time. Is the jewellery you picked the right size? The size of the jewellery you pick needs to be exact. If not, there will be a lot of discomfort when it is being inserted if it is too thick. Oppositely, it will be very uncomfortable if it is not thick enough as it may come loose very easily and move around a lot. Is the placement of the piercing exactly what you want? Placement is very important. You should use a marker and colour the area you want to be pierced and decide which area looks best for you. As well as this, a large portion of the piercing is inside your nose unseen, so make sure it is in an area where it won’t rub off any scars or bumps. Do the research! Compile a list of studios you would like to use, narrow it down, and see which one you are most comfortable with. Make sure you ask as many questions as possible about their sanitary conditions and the procedure itself. Make sure that both you and your piercing artist are well aware of any health conditions that might affect the piercing procedure or mean you should not get it done. Make sure to stock up on the aftercare products you are going to need, including healing oils and salt-spray solutions. Make sure you know what kind of nose piercing you want. If it is a nostril piercing, choose from ring, stud, screw or bone, or what kind of septum piercing you want to get. Remember, this is the jewellery that will stay in place the entire time you are healing. If you have got a bit of a cold, even if it is just the sniffles, you should consider rescheduling your piercing appointment as a nose ring may only make it more uncomfortable for you. A piercing artist will not pierce anyone who is drunk. As well as this, alcohol, caffeine and painkillers thin your blood, which you do not want when getting a piercing, so avoid all of these. Eat a small meal beforehand and drink plenty of water. 1. Keep your hands very clean and avoid using perfumed or chemical soap when washing them. Antibacterial is always the best choice. 2. Use one of our handy salt spray solutions regularly to prevent a buildup of harmful bacteria. 3. Use a thick tissue when dabbing in any solution, but use a gentle touch. 4. You should riggle your piercing very gently to make sure the solution soaks all the way through. 6. Be sure to follow this process for up to 9 months, even after the healing period, as noses are more likely to become infected as they are usually touched more. Like all piercings, nose piercings have risks such as irritation, infection, and rejection. Most nose piercings do require some extra attention in order to avoid infections or discomfort. Whereas most piercings have a specified healing time, it is important that you keep cleaning your piercing twice a day for up to 9-12 months. Infection may be present if your piercing is still irritated and red after 3 or more weeks, and a doctor should treat it accordingly. Rejection occurs when your nose decides it doesn’t like its new piercing and decides to push it out. Proper aftercare and not touching too much should keep this from happening, but you still need to be vigilant. Some people may be allergic to nickel, which is contained in surgical steel, so be sure to check out your best options when picking jewellery. There is always a risk of scar tissue or bumps forming following your piercing. Don’t worry, these will go away with time. Septum piercings could cause bleeding from the nose, which is not fun for anybody. If you notice any signs of bleeding without reason or problems breathing through your nose, go straight to your GP. If left untreated, this can be quite serious. You simply have to get used to not touching your piercing when it is healing. If you must touch your nose you need to make sure your hands are completely clean. Get ready to wash your hands a lot. You cannot apply any makeup, moisturizer or thick creams to your nose while it is healing, which can be several weeks. It’s just going to make things much more uncomfortable. You absolutely will not be able to go swimming with a new nose piercing. If you plan on competing in the 100m freestyle at the Olympics, it’s probably not worth weeks out of the pool for a nose piercing. Whatever you do, DO NOT REMOVE THE JEWELLERY. Even a few minutes out of your nose can cause the piercing to heal up, which just leads to more complications. You need to be prepared to wear your nose ring for a long time. Weird little bumps are going to appear on your nose after the piercing. This is normal, but also annoying. People will say it goes away in a day, other in weeks. Don’t worry, it will go away, but you’ll need to be prepared to tough it out. 2. You will touch it, and you will regret touching it! You’re going to want to twist and fiddle with your cool new piercing. It’s only natural. People are going to (rightly) tell you to stop touching it, and you should, but you probably won’t. Really though, you need to not touch your piercing. 3. You’ll pick your nose a lot! It sounds disgusting, but jewellery like the stud and the screw are going to cause a build up of snot in your nose. To stop it from randomly falling out in public, you will need to pick out the snot before it starts (hopefully in private). 4. It will be ripped out at some point! Unfortunately, unless you wrap yourself in bubble wrap, the piercing will get caught on someone's clothing or a pillow and get pulled out. It’s never a bad idea to buy two identical piercings so you can replace it ASAP and prevent the piercing healing over. 5. It’s totally worth it! Very soon after you get your piercing, you’re going to wake up one day with absolutely no problems, and you can just enjoy your awesome new look and have no regrets about getting it.